Have a laugh — it’s good for you! 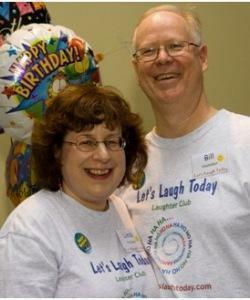 Certified teachers Linda and Bill Hamaker bring a "Laughter Yoga" session to Franklin. HAVE A LAUGH Discover the ways that laughter can improve your life by attending “Let’s Laugh Today,” a laughter yoga event in Franklin on Wednesday, Feb. 14, from 7:30 to 8:30 p.m. Certified laughter yoga teachers Linda and Bill Hamaker will lead the session at the Meetinghouse of the First Universalist Society in Franklin, 262 Chestnut St. Laughter yoga is a body/mind practice for well-being that involves deep breathing and stretching, playful laughter exercises, clapping, and deep relaxation. Its practitioners credit it with strengthening the immune system, combating the negative effects of stress, and serving as a powerful antidote to depression and anxiety. Any age and any level of physical ability can participate. A donation of $5 to support the church is requested ($10 maximum per family). Bring a water bottle. For more information, call 508-660-2223 or go to www.letslaughtoday.com. ROMANTIC EVENING “Love, Fashion and Song,” a romantic evening of fashion, dessert, and music organized by professional singer and Newton resident Olga Lisovskaya, takes place at Café St. Petersburg, 57 Union St., Newton Center on Wednesday, Feb. 14 at 7:30 p.m. Lisovskaya will be joined by baritone Junhan Choi for a performance of love songs and duets from operas, operettas, Broadway shows and songbooks, while local vendors exhibit unique fashions and jewelry. Tickets, which include coffee or tea and dessert, are $39 in advance or $45 at the door and can be purchased at www.OlgaLisovskaya.tix.com. For more information, go to www.OlgaLisovskaya.com or call 857-919–4832. LONELY PLANET New Repertory Theatre and Boston Center for American Performance present “Lonely Planet,” performed Feb. 3 through March 4 in the Black Box Theater at the Mosesian Center for the Arts, 321 Arsenal St., Watertown. In a revival to commemorate its 25th anniversary, “Lonely Planet” by Steven Dietz tells the story of two friends during the height of the AIDS epidemic in America. “Lonely Planet” will be performed in repertory with “Statements After an Arrest Under the Immorality Act” by Athol Fugard, an interracial love story from apartheid South Africa, as part of New Rep’s Statements of Survival Series. Tickets are $19-$42. For more information, call 617-923-8487 or go to www.newrep.org. COLLECTING CERAMICS Lacoste Gallery announces a new exhibition, “Through the Eyes of a Collector,” running now through Feb. 28. The exhibition offers an insight into the art collecting practices of Steve Alpert, an avid ceramic art lover and collector of more than 40 years. Alpert has brought together works by a group of diverse ceramic artists to illustrate the breadth and depth of today’s contemporary ceramic art, ranging from studio pottery work to figurative and sculptural ceramic art. Lacoste Gallery is located at 25 Main St., Concord. For more information, call 978-369-0278 or go to www.lacostegallery.com. ON THE EDGE 6 Bridges Gallery, located at 77 Main St., Maynard, presents “Precipice,” an exhibit of steel and mixed media sculpture and drawings by Samantha Pasapane on view now through March 3, with an artist reception on Feb. 17 from 4 to 6 p.m. For more information call 978-897-3825 or go to www.6bridgesgallery.com. AT THE DAVIS The Davis Museum at Wellesley College launches a wide-ranging set of spring exhibitions on Tuesday, Feb. 13. “Clarence H. White and His World: The Art and Craft of Photography, 1895-1925” offers a look at the work of a pioneer in early 20th-century photography, with an opening celebration on Tuesday, Feb. 13, from 5:30 to 9 p.m. “Artists Take Action! Recent Acquisitions from the Davis” features works acquired for the Davis over the past 10 years and explores how artists use the print medium to confront the social and political issues of their time. “Intermezzi: The Inventive Fantasies of Max Klinger” presents the recently acquired portfolio of 19th-century German artist Max Klinger. The Davis Museum is located on the Wellesley College campus at 106 Central St., Wellesley. For more information, call 781-283-2051 or go to www.wellesley.edu/davismuseum. LOOKING BACK Temple Shalom of Newton presents “Where Did We Come From: Jewish Immigrant Stories on Film,” a weekly series in which four classic films present some of the many challenges, mishaps, and opportunities experienced by European Jewish immigrants after they passed through Ellis Island and began life in America. Films to be screened are “The Jewish Experience: America” on Sunday, Feb. 18; “Hester Street” on Sunday, Feb. 25; “Lies My Father Told Me” on Sunday, March 18; and “Avalon” on Sunday, March 25. Each session will start at 2 p.m. with background material presented about the film. The films screen at 2:15 p.m. with a discussion to follow. Admission is free; no preregistration necessary. Temple Shalom is located at 175 Temple St., Newton. For more information, go to www.templeshalom.org/openyoureyes.